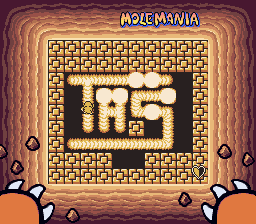 SGB Mole Mania (USA) in 08:09.0 by Ryuto. The player skips 6 levels out of 8 using a glitch, causing the time records to be nullified from the second stage to the seventh stage. The previous run used a reset glitch to perform this skip. This time, a different warp glitch was used, which is where most of the 2:45.93 improvement comes from.